Professional Western Astrologer, certified by Continuum for Astrocartography and Jeffrey Wolf Green for Evolutionary Astrology. Welcome to The Traveler's Well Astrology! We are each ancient travelers on a soulful journey. It is a pleasure to meet at the well and spend time in conversation before venturing out on the path before us. At The Traveler's Well Astrology, it is our goal to support your unfolding journey through life by providing astrological, spiritual and practical guidance. At The Traveler's Well, we refer to ourselves Spiritual Entrepreneurs and it is our pleasure to guide others on a similar journey as we each discover our pathway to sharing our greater gifts with the world. Since 2001, we have worked to build our astrological practice one step at a time and we have learned that being a Spiritual Entrepreneur requires embracing both courage and love and that the pathway is not clearly marked for our us! We must each discover our way and we are glad to support you on your journey! In 2005, I established my place as a leading expert in both Evolutionary Astrology and Astro*Carto*Graphy, when I delivered my first major lecture, 'Geodetic Map – Cultural Signatures, Past Lives and Current Events'. One year later, my lecture, 'Astrology of Location, Mapping Your Soul’s Journey', outlined my comprehensive system combining the mythic themes in the birth chart with Astro*Carto*Graphy, Geodetic and Local Space maps. My deeper gift comes from my ability to weave astrological themes with the language of classic myth and the philosophy of the Himalayan yogis into a rich tapestry that provides inspiration, clarity and a practical path to embracing the future. My own journey with astrology began in my teens around the same time I first met my Gurudev, Swami Rama of the Himalayas. As an adult, travel to India and Europe further inspired and deepened my passion for astrology, classic myth and the Quest for the Grail. Before transitioning to astrology, I succeeded in management and as a consultant and speaker. My efforts focused on helping both individuals and organizations to identify their core values and motivations in order to help them reach their highest potential while maintaining personal integrity. In 2003, I was certified to practice Astrocartography by Continuum the foundation dedicated to Jim Lewis who was the pioneer of modern location astrology. In 2004, I was certified by Jeffrey Wolf Green as an Evolutionary Astrologer. I am the only astrologer certified in both of these specialties. My practice is based on Western Astrology where I incorporate practical concepts for spiritual development from the Himalayan traditions in India (I am not a Vedic Astrologer). In 2007, my wife, Sappho, left her career as a technology consultant to join the Travelers Well full time. I alone provide all astrological consultations, but you will be corresponding directly with Sappho as you set everything up. Also, in 2016, I started using the name Wolfram, rather than Scott. This is where it all began baby! This is a chart that is full of myth with 5 planets in the 12th house and 5 interconnected yods forming a star pattern! My chart depicts my personal grail quest. Like Parzival in myth, I have skinned my knees many times on this journey of self discovery. The key is finding the grail! 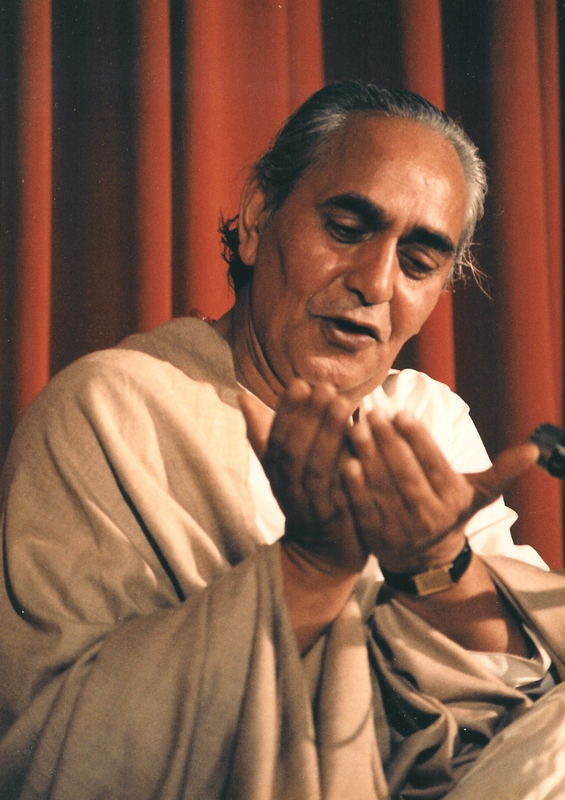 Swami Rama: “You are the architect of your life and you decide your destiny”. This quote from my Gurudev is not only at the heart of The Traveler’s Well, but also of how he has guided my life. Thank you Swamiji! John Lennon was a musical poet whose songs and lyrics became the “sound track” of my life from Imagine to Instant Karma to Grow Old With Me! But, my #1 favorite is Across the Universe. 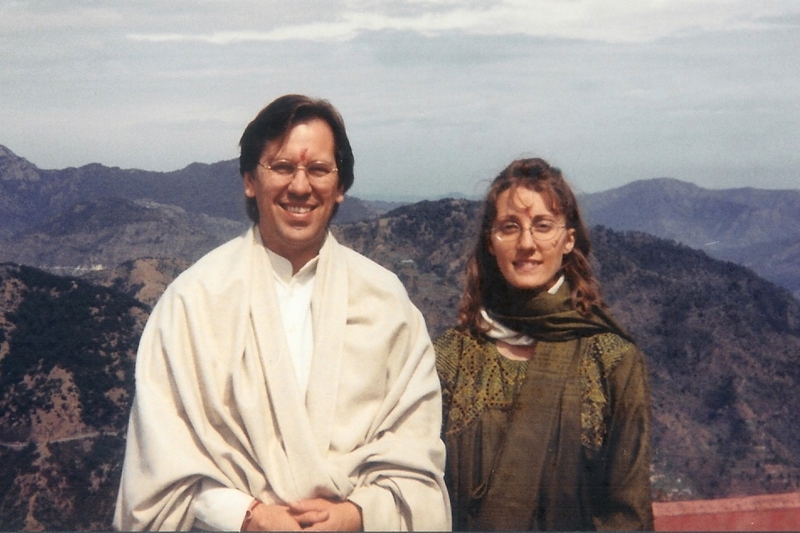 We were fortunate to have our wedding at Yogananda’s Lake Shrine in Pacific Palisades, California. Krishna playing his flute behind the waterfall added a bit of enchantment. We were blessed on that day to be “known together” and it seems that we have been ever since. The Kunjapuri Devi Temple near my Gurudev Swami Rama’s ashram in Rishikesh. The Ganges was low when we were there and one could walk from one large smooth stone to the next on the river bank. I sat on a large stone in the middle of the Ganges thinking, “I want to be smooth like the stones”. 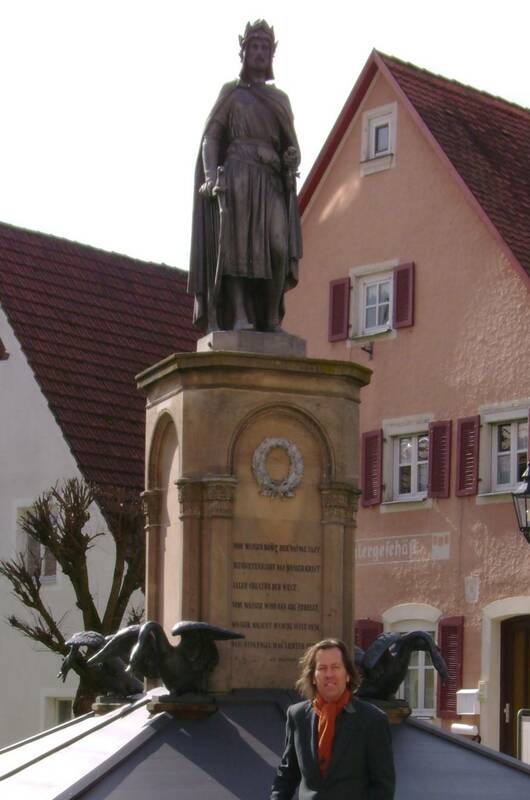 Wolfram von Eschenbach, was a knight, poet, songwriter and yes, astrologer in northern Bavaria who wrote Parzival. Discovering, or should I say re-discovering him was a powerful time of transformation of identity and clarifying my dharma. Astrology of location points to Bavaria as being part of my past lives.